A calligraphy brush is not simply a tool used for writing. It is a warp gate to freedom of mind, a storyteller of artist soul’s secrets, a mysterious artifact that pauses time and moves the heart of a viewer, a spark that ignites a white sheet of paper with shiny fire of ink. Whenever my fingers wrap around a brush, I am kidnapped into a realm of monochromatic magic, dissipated from reality, deep into a mist of sub-consciousness and memories a thousand years old. Figure 1. Every brush has a soul. It should be attuned to that of the calligrapher. 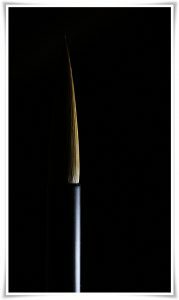 Pictured is a large size high quality weasel hair brush (鼬毛筆, いたちけふで, itachike fude). Most of you have seen the movie Harry Potter, especially the first film of the series. There is a scene in which young Harry chooses a wand, and the old wand vendor at Olivanders advises him, with his husky voice, that it is the wand that chooses the wizard, and the phoenix feather residing within each wand needs to be attuned to its owner. It is similar with brushes. Whenever I am rummaging around a calligraphy supply store, searching for a brush, I can spend hours looking for just the right one. I know very well that I do not only choose a piece of wood with hair glued at the end of it, but a friend in battle, a soul mate for the fantastic journey, a living entity that will channel the contents of my mind and speak as a voice of my soul. Like any living creature, brushes are not immortal. The day the hairs of life (命毛, いのちげ, inochige) wear off, the brush dies. Buddhist monk calligrapher and famed theoretician 智永 (Zhì Yǒng, birth and death dates unknown) of the Sui dynasty (隋朝, 581 – 618) placed brushes which had passed away into a rattan basket and then buried them in a “brush burial mound” (筆塚, Chinese: bǐ zhǒng), as if they were his brothers in arms who died on the battlefield beside him (Figure 3). Every brush is different and offers a different line. Treat yours with respect and it will harmonize with your inner self, setting your 書 (しょ, sho, in here: “calligraphy”) free and letting it soar like a dragon in clouds. According to the great calligrapher and theoretician of the early Tang dynasty 孫過庭 (Sūn Gòutíng: 646–691), also known as 孫虔禮 (Sūn Qiánlǐ), there are several conditions to be met in order to write powerful calligraphy. He lays them out in his book 書譜 (Chinese: Shū Pǔ, i.e. “Treaties on Calligraphy”), or more precisely in the preface to that book, as the rest of it did not survive until modern times. He referred to them as harmonies and discords. The first harmony is being happy in spirit and free from worries. The second harmony is having a rested mind and body. The third harmony is having good weather and proper moisture in the air. 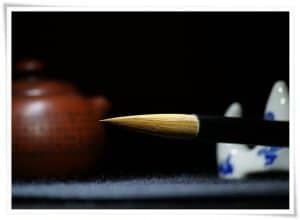 The fourth harmony is having the perfect match between all Four Treasures of the Study (文房四宝, ぶんぼう しほう, bunbō shihō; namely: brush (筆, ふで, fude), inkstone (硯, すずり, suzuri), ink (墨, すみ, sumi) and paper (紙, かみ, kami). The fifth harmony is a sudden desire to write. The conditions opposing the five harmonies are called discords. Only when the five harmonies occur together does the mind ascend and fly, and so does the brush. Clearly, it is very important to pick suitable Four Treasures. Figure 2. A vigorous and healthy tipped, high quality weasel hair brush (鼬毛筆, いたちけふで, itachike fude). 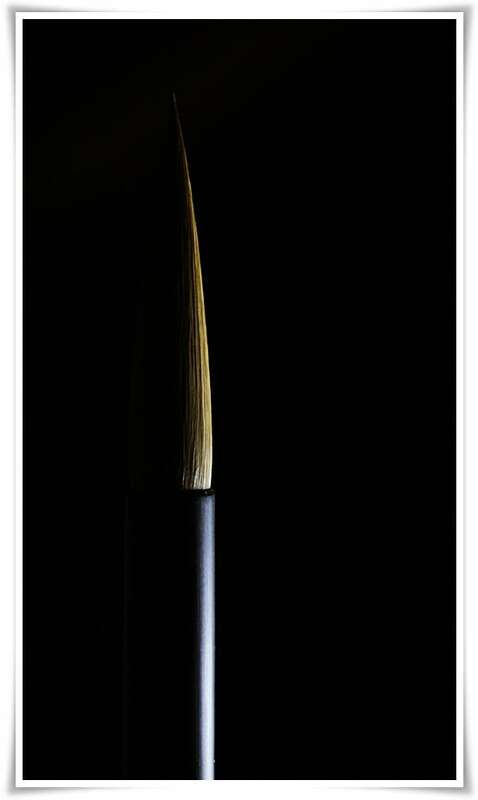 A good brush is like an athlete or a war horse, once you glance at it, you can sense the dreaming spirit within its tuft, waiting patiently to be awakened. So, how do we choose a proper brush then? Well, first of all we need to think of the purpose for which we will be using it. While it is true that a calligrapher should be able to write anything with anything, and that many ancient calligraphers picked particularly difficult brushes (or other items) to write certain styles in order to become more skilled in using them (for example they used very long soft mountain goat hair brushes (羊毛筆, ようもう　ふで, yōmō fude) for writing seal script (篆書, てんしょ, tensho), it is a fact that there are still certain recommendations for selecting a brush. For example, for writing in cursive (草書, そうしょ, sōsho) and semi-cursive (行書, ぎょうしょ, gyōsho) scripts, a flexible brush with responsive hairs is preferred. It will ensure that details and dynamics are easily conveyed and properly emphasized by the vigorous tip of the brush. On the other hand, for writing in clerical script (隷書, れいしょ, reisho) one will most likely reach for a softer brush with mid length hairs so that it will be easier to brush strokes characteristic of clerical script. A beginner will use a harder brush, whereas a more experienced calligrapher will prefer a softer one because more interesting lines can be written with it. I needed a fast (quick response brush tip) yet not too hard brush which would convey my emotions smoothly and without any filtering. My nature is like a mountain creek. It curves and surprises by changing its direction or speed, constantly seeking a new path. It is rapid, yet clear, not violent but dynamic, and finally, it nourishes but does not overflow without a reason. Figure 3. A brush tomb (筆塚, ふでづか, fude zuka) with a container for old brush offerings (奉納, ほうのう, hōnō, i.e. 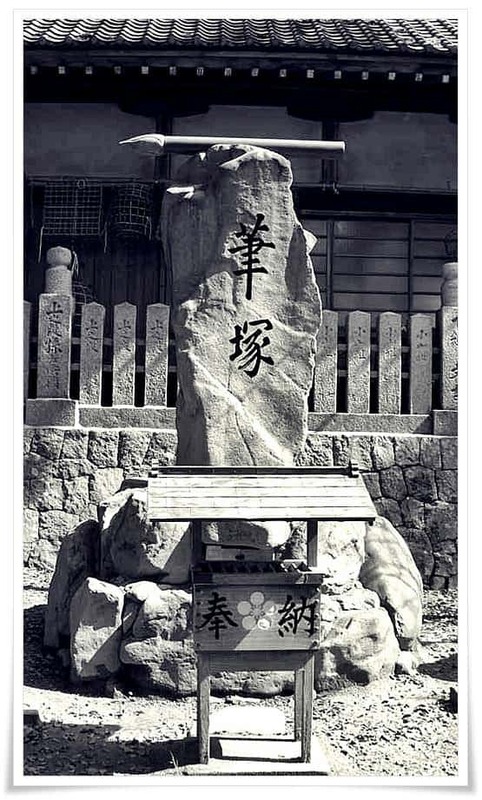 “offering”) in front of a Buddhist temple in Japan. Old brushes are burned in such containers, their souls are thus released. I truly enjoy writing in all scripts though cursive and semi-cursive are my main choices for 創作 (そうさく, sōsaku, i.e. “one’s own composition”). Carefully selected high quality weasel hairs have exactly those qualities. They have the reflex of a lightweight boxer, yet are able to deliver a powerful hit. Budget is always an issue, though when choosing a brush or any other item of the Four Treasures of the Study, one must consider the quality output of one’s own work and also all those aspects that Sūn Gòutíng mentions in his book. The harmony of the Four Treasures is absolutely essential, and it may, perhaps will, influence the mood of the calligrapher. Sometimes, spending a little more money pays off throughout the pleasure of writing. Alas, some brushes can be extremely expensive. Usually, the longer the hair, the higher the price. I have seen top quality mountain goat hair brushes for as much as $16,000 USD. Since weasel hairs are relatively short, the brushes of a longer tuft can cost around $200 each or more, as they need to be carefully selected. Still, when a brush is well crafted and well maintained, it should last for a few years. From such a perspective, it may not seem so expensive after all. Figure 4. 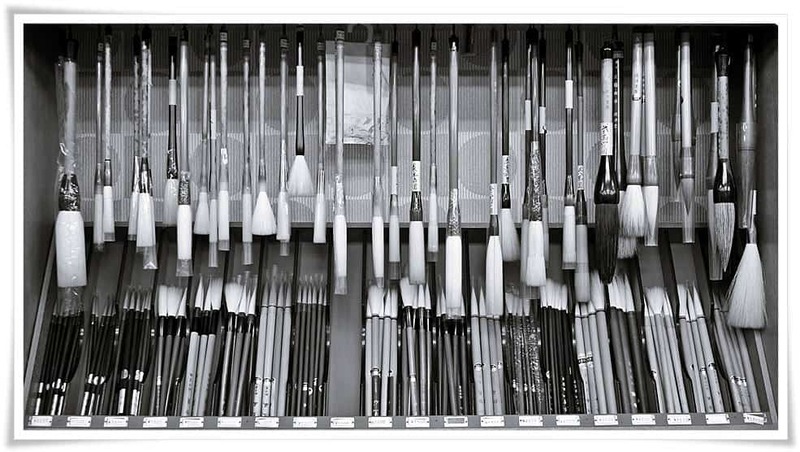 A section of a shelf with brushes in one of the calligraphy stores that I often visit to purchase certain items. 跋渉堂 (ばっしょうどう, Basshōdō), Greater Tokyo, Japan. Naturally, for a brush like this, one will need a good quality paper such as 宣紙 (Chinese: Xuān zhǐ, i.e. “Xuan paper”), inkstone, and ink. An inkstone that grinds too large particles of ink will produce liquid ink that may damage the brush. Paper that has low blur quality will dull the vigour of the brush strokes, and characters will look lifeless. Low quality ink, with a large percentage of animal glue, will not spread well on the paper surface, and the strokes will not be full and healthy, or will be of a pale colour. One needs to keep all of that in mind when purchasing their Four Treasures. Having said that, it is not necessarily true that the most expensive ink will produce a fantastic line. The harmony of the Four Treasures is what is critical, their cost is secondary. Also, it is not true that all cheaper brushes, inksticks, etc. are not worth considering. Sometimes, a $10 USD brush can be better than the one ten times more costly. It all becomes dependent upon our ability to find just the right brush for the task, the proverbial needle in the haystack. 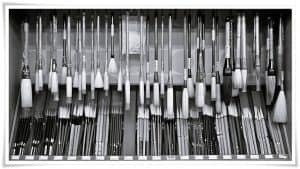 In the second part of this article I will discuss the particulars of the brush I purchased. I will take you through the key points of how a good quality brush should look, feel, and how it should perform. Just a quick thank you for an exquisite article. Delighted to read your response Clay and hoping that you will be inclined to visit often. This is a beautiful article Ponte! Bravo.